This section describes some generic commercial & industrial applications that can use waste thermal energy. Integration into a specific manufacturing facility will always require further site-specific analyses. 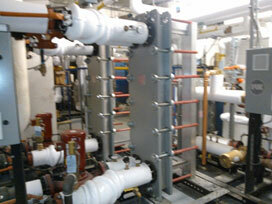 Ideal CHP applications would simply replace or supplement a hot water, steam, or cooling requirement within a plant. Adaptation of cogeneration technologies could be greatly improved by using packaged CHP systems that are developed to minimize site engineering. 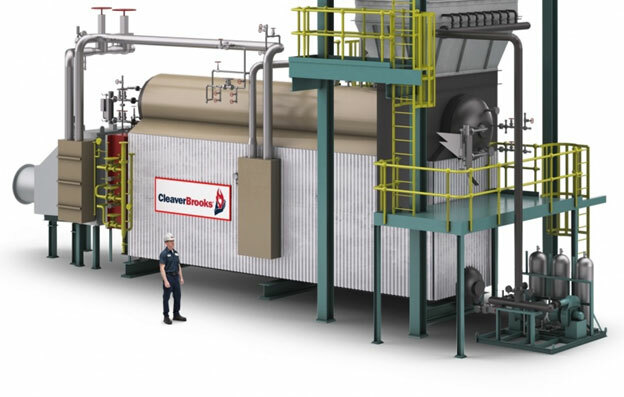 Auxiliary burners can increase the flexibility of the CHP system by creating a higher grade waste heat stream than what the exhaust alone produces. – Equipment “clean-down” and sanitizing in food industries (meat, dairy, sugar refining, etc. ), pharmaceutical and “bio” processes. – Continuous washing operations in raw food preparation (cane/beet sugars, meat, etc. ), textiles, wood/paper pulp, removing oils and other excess matter (paint, dust etc. ), in metals fabrication and molded plastics industries (auto parts, sheet metal, cans, food/beverage containers, etc. ), and in synthetic rubber and fiber manufacturing.  Flushing operations for process piping and batch equipment (paint blenders, fermentation vessels, etc. ), particularly for operations using the same process lines/equipment to produce slightly varying products (paints, candy slurries, pharmaceuticals, etc.). As a solvent for raw material preparation, leaching, and separations/extractions, and to capture pollutants in emission control operations. Water is typically chosen when these systems handle inorganic solids, acids, polar fluids, and crystalline salts. As a crystallization/fermentation/reaction media in industries producing wine/maltbeverage, dairy, pharmaceutical, and inorganic chemical products. To heat jackets for vessels/operations below ~230 °F, including chocolate tempering, crystallizers, and storage vessels/mixers containing viscous materials. It should be noted that hot water generated from direct contact with natural gas derived combustion exhaust has been approved for food manufacturers including dairy, meat plants, and beverages.